Arguably one of the least favourite months of the year, (maybe the best if you are an avid rugby fan ), November is known for its dreadful weather; from bucket loads of rain to freezing temperatures, the days are dark and gloomy and people are less likely to go out and socialise; preferring to stay inside for warmth. These weather conditions are tough on the mind and the body and many people will feel the effects of the poor weather and become ill. 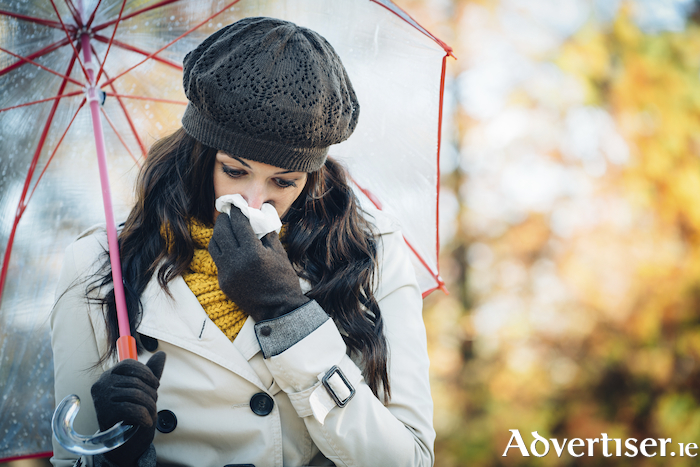 Here at the advertiser.ie we provide some top tips to stave off the flu and cold this winter. When winter sets in, it is hard to escape the winter slump. Many people will feel sluggish and tired during the colder months of the year. The lack of sunlight is one of the primary reasons for this as it disrupts our sleep patterns. So what is there to do? Make an effort to get outdoors during daylight hours; get into a sleeping routine - going to sleep and waking up at the same time, and do a bit of exercise. Vitamin D helps off fight off illness. Our main source of vitamin D is from the sun and during November there is not much sunlight, ergo not much vitamin D. Pick up some vitamin D supplements from a local pharmacy in order to help you fight off the colds and flus this winter. Fibre found in apples, oats, and nuts is brilliant for boosting the immune system and important to decrease inflammation. This soluble fibre helps reduce cholesterol levels in the body and aids in weight loss and protection against diabetes. Find yourself craving a juicy burger and savoury curry. Takeaways and unhealthy comfort food is hugely tempting when it is cold and dark outside and when you cannot be bothered cooking after a long day of work. But your five a day is still as important during winter as it is spring. If you want something sugary, why not try a satsuma or clementine instead of a chocolate bar. It may sound like advice from the Victorian age but staying away from people who have a cold or flu helps in your chances in staying fit and well during winter. Why not purchase some anti-bacterial hand gel? Clean hands mean clean living. So there you have it. Stay healthy. Disclaimer: always consult a GP when it comes to health advice. To advertise your Health & Wellbeing services visit Advertiser Classifieds where you can promote your business for just €4 per month.